Jct. Of Jayhawk Dr. and Sunflower Rd. 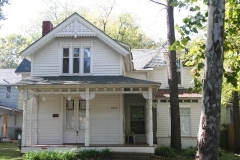 On the eastern slope of Lawrence's Mount Oread, the Bailey House is just a few blocks from the University of Kansas campus and is a contributing resource in the National Register-listed Oread Historic District. As the university expanded in the early 1900s, this neighborhood became a popular place for faculty and staff to build residences. Artist and architect William Alexander Griffith designed the house, which was erected in 1908 as a residence for E. H. S. Bailey, head of KU's chemistry department from 1883 to 1933. Bailey Hall on the KU campus was built in 1905 to house the chemistry department, and is listed in the National Register in part for its associations with Bailey as a reflection of his successful career. His residence, which blends several popular styles of the early 1900s including Richardsonian Romanesque, Dutch Colonial Revival, and Craftsman, is nominated for its architectural significance. Kansas City-based architect Charles A. Smith designed the Baldwin City School, which opened in January 1923. The building embodies Progressive-era tenets particularly involving specialized classrooms. It hosted both elementary and high school classes until a new high school was built in 1969. Topeka-based architect Thomas W. Williamson designed a detached auditorium and gymnasium that was completed in 1942 as part of the Work Projects Administration program. Both buildings functioned as a part of the local public school system until 2011. 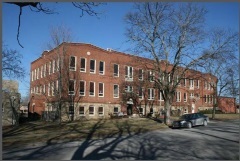 The property is nominated as part of the "Historic Public Schools of Kansas" and "New Deal-era Resources of Kansas" multiple property nominations. Constructed in about 1857, the Barnes Apple Barn is a gabled, metal roofed limestone structure for the purpose of processing grapes, apples and pears from the Vinland Nursery and Fruit Farm. It was nominated for its association with William E. Barnes, a co-founder of Vinland, Kansas, and the originator of the first vineyard in Kansas. 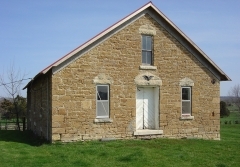 It was also nominated for its architectural significance as an example of a gable-roofed limestone agricultural processing building. 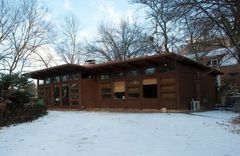 The 1950 Beal House is an outstanding local example of Usonian organic architecture. KU Architecture professor George Malcolm Beal expanded upon Frank Lloyd Wright's Usonian design principles by calculating site-specific sun angles using an original heliodon instrument he designed and built for early sustainable design classes at KU. As a result of these calculations, the roof overhangs the nearly all-glass south elevation to take full advantage of solar gain in winter and shade in summer. The house's period of significance spans from 1950 to 1968, when George and Helen Beal moved. 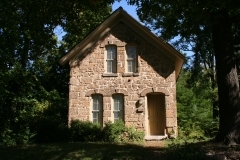 The house and site are nominated as part of the "Historic Resources of Lawrence" under Criterion B for its local association with George Beal, who designed and resided here while shaping the transition of the University of Kansas's architecture program from classical to modern and under Criterion C for its architecture and engineering. Though her association is outside the period of significance, State Representative Betty Jo Charlton resided here from 1971 to 2014; she was the first woman legislator from Lawrence, serving from 1979 until 1994. 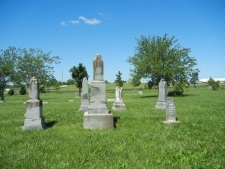 Established in 1858, the Beni Israel Cemetery near Eudora is the only surviving property associated with the Jewish community in Eudora, which flourished briefly from 1857 to 1867 before moving to Lawrence. 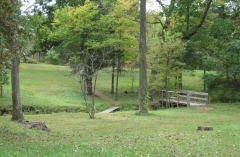 Jewish settlers were among the first Eudora residents. Of the 29 heads of families who arrived in Eudora in 1857, approximately seven were Jewish. Many of Eudora's early Jewish family names, such as Urbansky, Cohn, and Katzenstein, grace the headstones of the Beni Israel Cemetery. In 1868, the Jewish community in Lawrence organized as the Society of Beni Israel under the leadership of seven trustees and assumed responsibility of the cemetery. Burials continued at the cemetery until the late 1920s and then remained largely idle until it was reactivated in 1978. Over time, the cemetery came to represent the Jewish community in Lawrence and Douglas County and remains today as a reflection of their collective history and religious and ethnic identity during the late 19th and early 20th centuries. 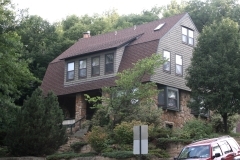 It was nominated for its local significance in the areas of early settlement social history.